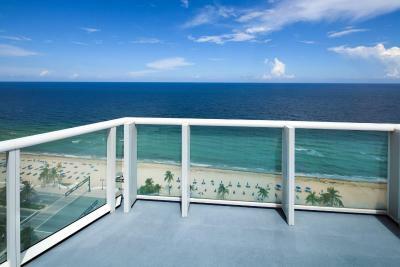 Lock in a great price for W Fort Lauderdale – rated 8.2 by recent guests! The staff were amazing, especially Maria at check in. This place is under rated to say the least. Great staff, phenomenal dining, excellent location. 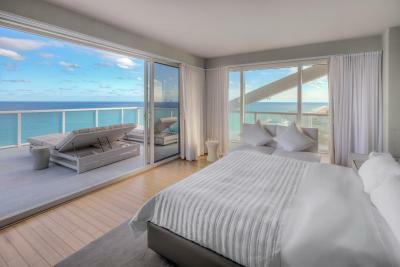 Great relaxation is to be expected when staying here. This place had a great location with the beach access being right across the street and very close to all the shops & places to eat! Beautiful property with GREAT customer service! Will stay again. Bed was comfy and the room was beautiful! 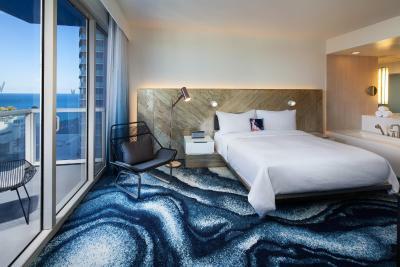 The style of the room was amazing. I like the pool area and enjoyed laying in the sun. 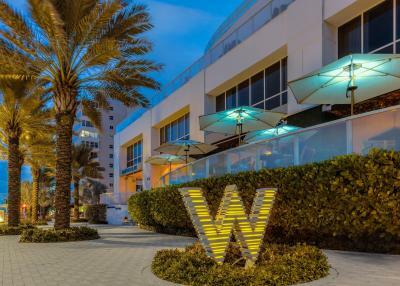 W Fort Lauderdale This rating is a reflection of how the property compares to the industry standard when it comes to price, facilities and services available. It's based on a self-evaluation by the property. Use this rating to help choose your stay! 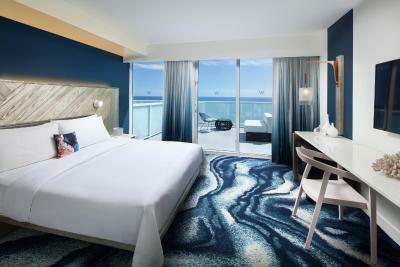 One of our top picks in Fort Lauderdale.Overlooking the Atlantic Ocean, W Fort Lauderdale is 8 minutes’ drive from the luxury shops of The Galleria at Fort Lauderdale and provides 24-hour room service to guests. 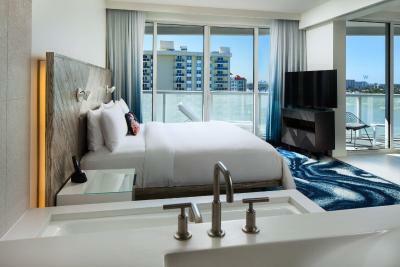 Spacious rooms and suites include iPod docking stations, flat-screen TVs, and floor-to-ceiling windows. 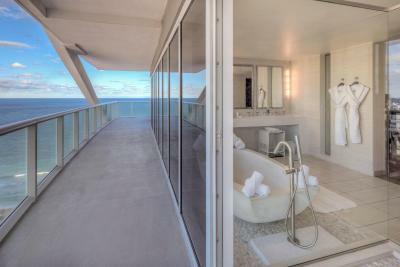 Private bathrooms house Bliss Spa® amenities. 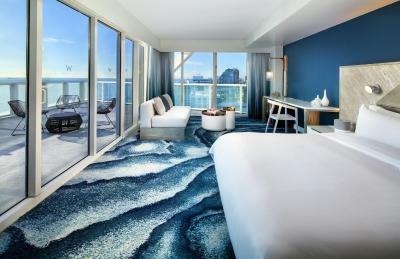 The rooftop pool offers panoramic views of the city as well as intracoastal views of the waterway, while Bliss Spa® provides massages, manicures, and a number of other services. STEAK 954 offers a modern take on classic steakhouse staples for breakfast, lunch, and dinner while WET® Deck Bites serves up soups, sandwiches, and cocktails until sunset. Las Olas Boulevard’s unique shops and restaurants are 14 minutes’ drive. Port Everglades is 9 minutes’ drive and Fort Lauderdale-Hollywood International Airport is 6 mi drive. 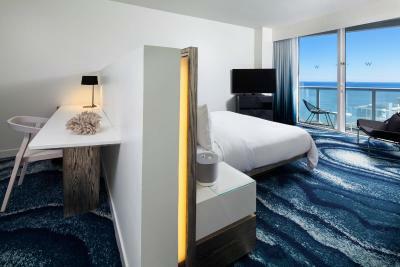 This is our guests' favorite part of Fort Lauderdale, according to independent reviews. 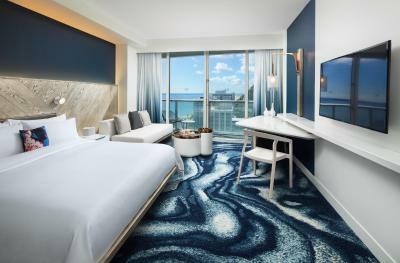 When would you like to stay at W Fort Lauderdale? Private parking is available on site (reservation is not needed) and costs USD 42 per day. 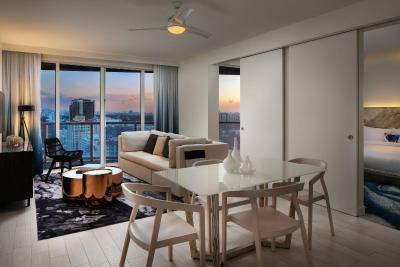 House Rules W Fort Lauderdale takes special requests – add in the next step! 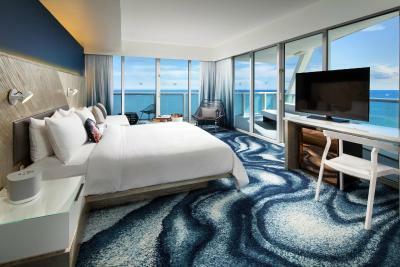 W Fort Lauderdale accepts these cards and reserves the right to temporarily hold an amount prior to arrival. 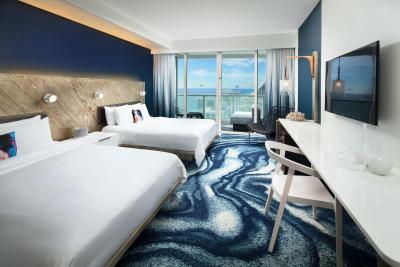 Guests must be 21 years of age or older to check-in without a parent or official guardian. 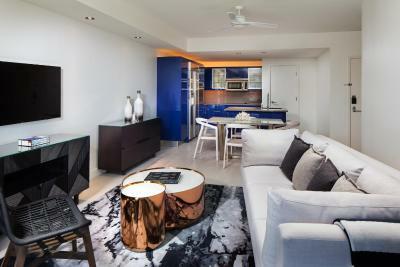 The resort fee is mandatory and charged per room per night. Tax is not included and is applied at check-in. Ice , ice and more ice. No place to keep drinks cold, and when ice was requested it never came . Room was not ready for check in. Walls very thin so all heard. Cleaning of room during stay not done until after 4. Only 1 robe. No washcloths. 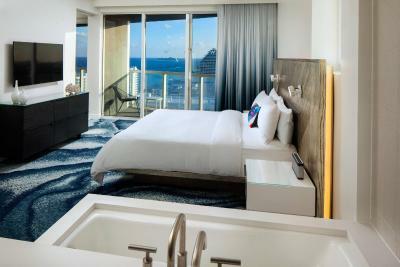 Lighting in guest rooms, especially bathrooms, needs improvement. Main reason for the less than stellar score is that it seems overpriced for what you are getting. Part of a group. Catering for the group was excellent. Steak restaurant on site excellent. Main pool area beautiful. Staff very friendly and helpful. 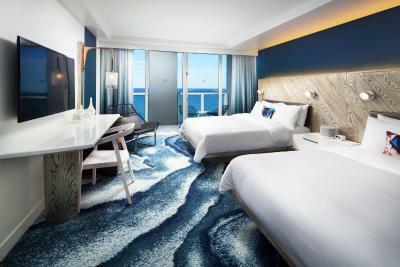 The room was not to standard. Stains in the bath, yellow stains in the sink. Not what we expect from W. We were eventually given a better room but the attitude from the receptionist was terrible, telling us if we wanted a different room they will apply a change extra. However, there are few elevators to serve the hotel which is very large and was full in the New Year period. The waiting line for the elevators arrived within 20 minutes. Cleanliness left much to be desired, both in the bedroom and in the hallways. Food plates were waiting for 12 hours in the corridor waiting to be picked up. The checkin staff was always rude and impatient. The room is very comfortable and spacious. The pool staff is very nice and attentive. The location is great! Service desks and elevators were very slow! Other than that, no complaints! Cleanliness was under par in the bathroom. The pool area wasn't cleared of food regularly so there was an issue with birds by the pool. Loved the pool area and bedrooms.